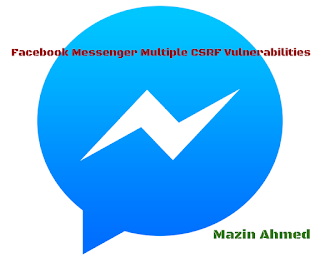 In this post, I will be demonstrating the findings of multiple interesting cross-site request forgery vulnerabilities that I have identified on Facebook. These vulnerabilities allows an attacker to force the victim to do various actions. On April 2015, Facebook officially launched messenger.com, a stand-alone Facebook messenger for the web. After hearing about the launch I have started to testing it in my spare time. Using this issue, I was able to force any user to send messages to other users without the user's knowledge. Using this issue, I was able to force any user to delete messaging threads. Change of the value of "ids" parameter to the victim’s thread ID. The issues has been fixed very quickly. I would like to thank Facebook security team for their outstanding work in responding to security submissions.